The English word "temple" derives from Latin templum, which was originally not the building itself, but a sacred space surveyed and plotted ritually. 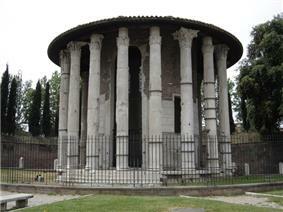 The Roman architect Vitruvius always uses the word templum to refer to the sacred precinct, and not to the building. The more common Latin words for a temple or shrine were aedes, delubrum, and fanum (in this article, the English word "temple" refers to any of these buildings, and the Latin templum to the sacred precinct). Public religious ceremonies took place outdoors, and not within the temple building. Some ceremonies were processions that started at, visited, or ended with a temple or shrine, where a ritual object might be stored and brought out for use, or where an offering would be deposited. 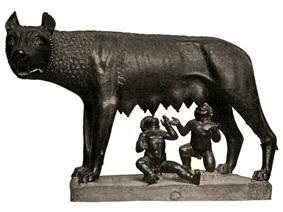 Sacrifices, chiefly of animals, would take place at an open-air altar within the templum. 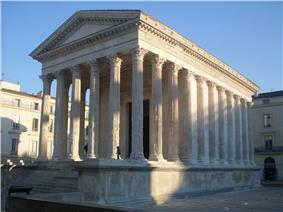 The Roman temple architecture style was derived from the Etruscan model. The Etruscans were an indigenous Italian race which was at its peak in the seventh century BC. In turn, the Etruscans had adopted other styles into their temples, of which Greek architecture was the main influence. Therefore Roman temples were distinct but also based on both Etruscan and Greek plans. 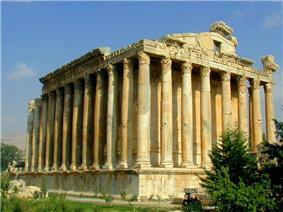 Roman temples emphasised the front of the building, which consisted of a portico with columns, a pronaos. This departs from the Greek model of having equal emphasis all around the temple, where it could be viewed and approached from all directions. A caesareum was a temple devoted to Imperial cult. Caesarea were located throughout the Roman Empire. In the city of Rome, a caesareum was located within the religious precinct of the Arval Brothers. In 1570, it was documented as still containing nine statues of Roman emperors in architectural niches. These are all lost, but the base for the statue of Marcus Aurelius survives, and altogether the inscriptions of seven of the nine are recorded in volume 6 of the Corpus Inscriptionum Latinarum. One of the most prominent of the caesarea was the Caesareum of Alexandria, located on the harbor. During the 4th century, after the Empire had come under Christian rule, it was converted to a church. ^ Jane Fejfer, Roman Portraits in Context (Walter de Gruyter, 2008), p. 86.